Heaven or Hell?Are you 100% sure you will go to Heaven when you die? Many of us have been on the path to insanity and we didn’t even know it. 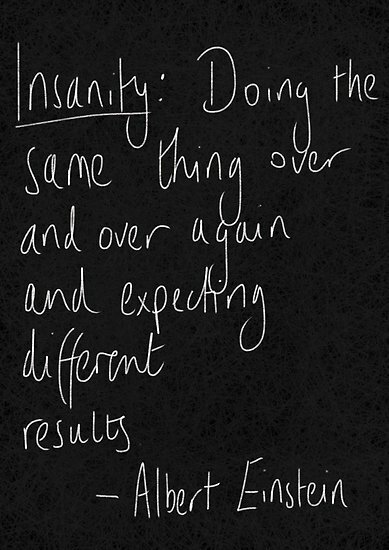 I have heard the definition of insanity to be continuing on the same path; doing the same thing over and over, expecting different results. I have lived long enough to see my own life and the lives of others fall into this ‘insanity’. As I read in Joshua today, I saw a young man who witnessed many a miracle while following his mentor and leader, Moses. Now, God desired to use him in the very same manner, but Joshua’s heart needed to be prepared for what would happen. So many times God reassured his servant that He would be with him. Three times God admonished Joshua to ‘be of good courage‘ or ‘be very courageous‘. 2019 will be that way for us. For many we are facing this year with challenges we are bringing with us; walking alone as some have left us; and walking slower because we been presented some hefty challenges. For some those challenges are self-inflicted while others have been placed on us by others. If we choose, we can follow along the same path we have always taken; thinking things will be different. But, before you and I commit another act of insanity, can we resolve to do this one thing – to seek God’s way in and through our problems this year? As a purchased possession of God, I am NOT my own. Therefore, I must yield my will and my way to the One who has rightful ownership. Thinking I know better than God for my life makes me at the very least selfish and at the most – saying ‘I am the god of my life’. Wanting to be more than He designed me to be is prideful. A fully functioning church is a formidable weapon against our enemy. When we are of one heart and one mind, God can guide and direct as He will with whom He chooses. If we, the church, believe that the time is short – and it is – we must break out of the insanity of doing what we used to do thinking this year will be different. Happy New Year dear reader! May this year be one of souls witnessed to and won; spiritual growth, and answered prayer! A married husband of four adult children; grandparent to four lovely grandchildren; assistant pastor, Bible teacher, preacher, and director for a faith-based addiction program RU Recovery. If I do not answer, please leave a text or a voice message - I will respond. ...and ye shall be witnesses unto me both in Jerusalem, and in all Judaea, and in Samaria, and unto the uttermost part of the earth. Glow humbly into the world.